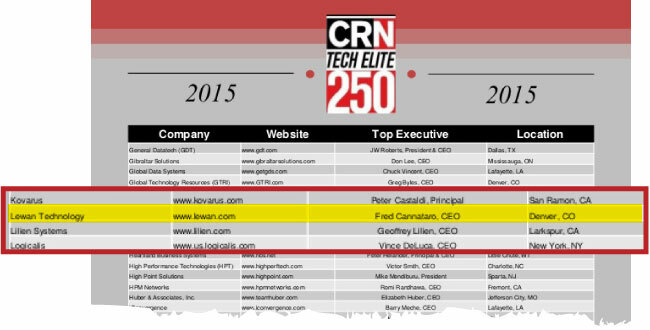 For the third year in a row, Lewan has earned a prestigious spot on CRN's 2015 list of Tech Elite 250 IT Solution Providers. This elite group of IT solution providers have invested in the training and education needed to earn the most advanced technical certifications from leading vendors. For the third year in a row, Lewan has been recognized for our exemplary approach to delivery of Managed IT Services and been awarded a spot on the 2015 MSP Elite 150 list, part of CRN's Managed Service Provider 500 (MSP500) list. The Elite 150 group is recognized as large data center-focused solution providers with a strong mix of on-premise professional services as well as off-premise services. Lewan has once again earned a prestigious spot on CRN's 2014 list of Tech Elite 250 IT Solution Providers. This elite group of IT solution providers have invested in the training and education needed to earn the most advanced technical certifications from leading vendors. The annual awards honor Dell partners for delivering exemplary solutions for their customers during the past year, and guess what? Lewan is Dell's Partner of the Year! We often tell customers and prospects of our expertise with Dell hardware and software solutions but I'm guessing most of them just think that's a sales pitch, it's not, it's a fact. This lesson will show how to defragment the disk group on a Dell MD3000i storage array. Defragementing the disk group will merge and free up capacity within the disk group. Why the need to Defragment the Disk Group? We can see the issue that is caused when we have deleted virtual disks inside a disk group by clicking on the "Disk Groups & Virtual Disks" link under the Summary tab on the Dell Storage Manager application. As shown above, you will see areas of "Free Capacity" which are stranded from each other, as they are not contiguous. To perform the disk group defragment, you will need to have installed the Dell MD Storage Manager CLI/Utilities onto a host (usually the same host that has the Dell Storage Manager installed will have the Storage Manager CLI installed as well). smcli -n hostname -p password -c "start diskgroup  defragment;"
The "hostname" field above should be replaced with the actual hostname of the storage array. The "password" field above should be replaced with the configuration password for the array. The diskGroup # is actually the identifier of the disk group. Ours happens to be the number "1". Next you should receive a screen like the above which shows the command completing successfully. Notice the icon has changed for the virtual disk (2) which shows it is defragmenting the data. SMcli -n hostname -p mypassword -c "show virtualDisk [vdiskname] actionProgress;"
The "vdiskname" field above should be replaced with the virtual disk name. Once the command executes, you should see the Defragment operation running as well as the percentage complete. Defragmenting the virtual disk will usually take awhile, so be patient during this process. smcli -n hostname -p mypassword -c "set virtualDisk [virtualDiskName] modificationPriority=highest;"
Once the command executes, you should see a screen like the above. You can confirm the rebuild priority was changed by using the command listed above for monitoring the virtual disk. This will also show the rebuild priority, as circled in our screenshot above.